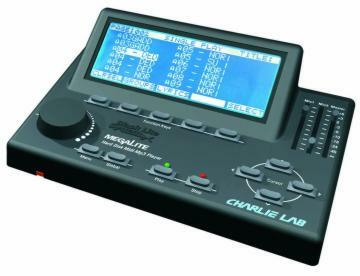 Unveiled at Musikmesse Frankfurt, the Charlie Lab Megalite Midifile and Mp3 player provide an easy to use solution for playing standard MIDI files (formats 0 and 1), karaoke files and MP3. The Megalite boasts a highly intuitive user interface and can store up to 5.120 songs on a 2,5" built-in hard disk. The unit features a mixing section with two balanced microphone inputs with independently adjustable gain, EQ an volume. Reverb, chorus and delay effects are available. Megalite offers a global equalizer and Spatializer effect in its output section. The player uses its own GM/GS MIDI sound generator and has MIDI out port. The Megalite sports a Video in/out socket using a vido composite signal. Lyrics, chords and a song list can be displayed on a standard televison. Mp3 management includes pitch shift without tempo change and speed change without pitch alteration as well as panpot and volume control. Working with MIDI files users can rely on real time MIDI parameter savings capabilities such as volume, panpot, transpose, tempo, reverb, chorus and more for each song. Songs are alphabetically sorted and organized in 999 groups containing 48 songs each. Software for songs transfer and backup via USB is included. A floppy disk drive is optional. © 1997 © 2004 Pro-Music-News. All rights reserved. Thank you for visiting Pro-Music-News.